Einojuhani Rautavaara (1928–2016) would have turned 90 October 9th, 2018. During his long career as a composer spanning seven decades from the late 1940s until his very last days, the composer created a wide list of works in various music genres, including 8 symphonies, several concertos and operas as well as a large amount of vocal and chamber music – majority of them have been recorded by Ondine. The recordings released by the label played a key role in bringing the composer to international attention during the 1990s. 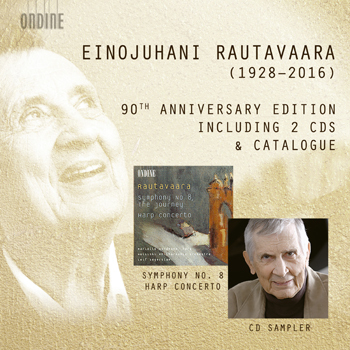 This anniversary release includes a re-issue of his 8th Symphony, written for the centenary of the Philadelphia Orchestra, his Harp Concerto, written for the Minnesota Orchestra, as well as a sampler of selected moments from Ondine’s extensive Rautavaara discography.